Here is the first of my planned Modenese brigade. 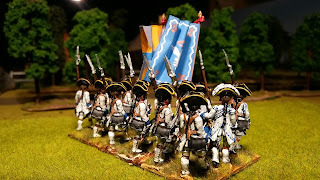 I intend doing four or five battalions uniformed as they were in exile after the Piedmontese invasion in March 1742. In reality the Duke of Modena escaped with only his personal Guardia del Corpo. Other remnants of the army made their way into exile to join the Spanish in the south. 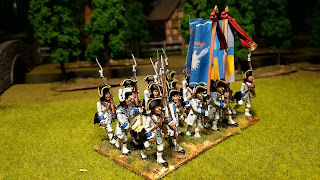 Now I had planned to replicate the 10 battalion army that tried to resist the Piedmontese but I have decided to assemble a much more disperate force consisting of one Modenese brigade, one Neapolitan brigade and two Spanish ones plus cavalry. The Modenese brigade will consist of 4 ‘National’ battalions, and Reggio is the first of them. The uniform details are from Manley and they agree in almost every detail with the Vinkhuizen plates, one of which I show here. The uniform is really quite different from the later SYW. The only detail where Vinkhuizen and Manley differ is in the stock; the latter described this as red. One further detail is that the plate shows the pre-invasion black cockade. Manley mentions that they adopted a yellow cockade so I like the sound of that. In all other respects though these can serve as pre or post invasion. Also, a word on my choice of figures. 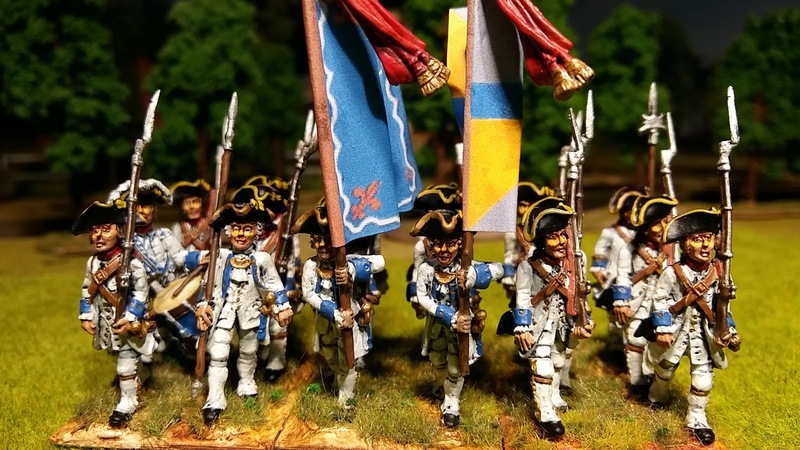 I like the Black Hussar French figures so much that I will use them for the entire brigade, maybe even for the other nationalities. I know that the coat should be closed and buttoned up but it is hot in southern/central Italy and permission is granted to them to unbutton their coats to prevent over-heating! Finally, I am a little unsure about which nationalities formed their battalions in 3 or 4 ranks. This is important (and frequently overlooked by many sets of rules of the period). It is important because a 3-rank battalion will be able to fire every rank (in rotation) whereas a 4-rank battalion will only be able to fire the front three ranks (in rotation) and will hold the forth rank in reserve. This make them (the 4 rank battalion) probably better in melee if it ever comes to that. But a three rank battalion of, say, 600 men will have 200 men in the front rank for the initial volley. The 600 man battalion in 4 ranks will only have 150 men in the front rank. 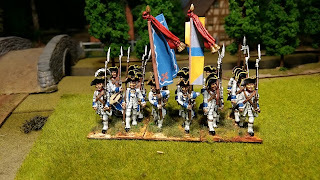 Using my ground scale of 1mm = 1 pace this battalion has about 400 men in 4 ranks. I know that France formed in 4 ranks in the WAS. French policy was not to rely on firing but to close with the bayonet. Spain followed the French tactics and Naples followed Spain in this regard. Unknown to me is what Modena and Piemont did. I have assumed that Piedmont formed in 3 ranks and Modena in 4. If anybody knows to the contrary, pease be good enough to let me know. What you see here is a Modenese battalion in 4 ranks (3 ranks of actual figures). Plus any help with Neapolitan flags of this period would be a great help. But if they are firing by platoons it will make no difference whether they are in 3 ranks or 4? The 4 rank unit will merely have its fourth rank as one of its platoons. Neapolitan flags are a different kettle of fish. 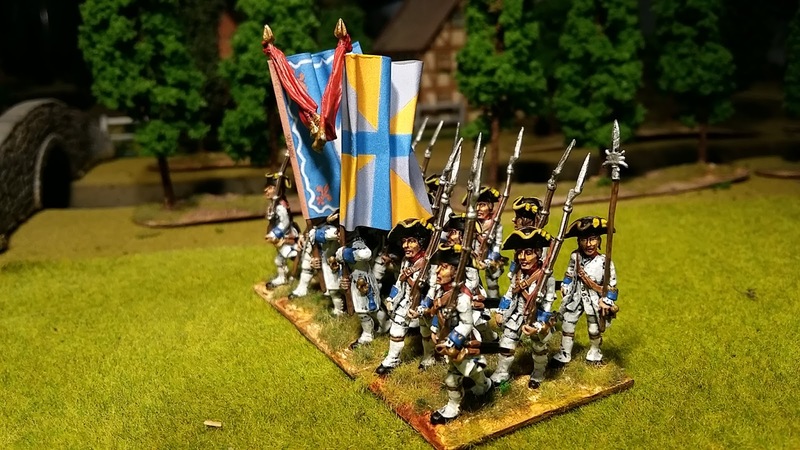 I've searched the Net for infomation on these and all I've been able to glean is that they were modelled on Spanish flags but that the Colonel's flag had the Neapolitan Coat of Arms etc instead of the Spanish one while the Ordinance flags had the ragged red cross with province etc. symbols as per Spanish flags on cross ends. But what symbols - I know not. You can see originals of the Spanish flag in the article (online) called Trofeos de Las Campanas de Italia (1717-1748) by Luis Sorando Muzas. Somewhere too on the Net there is an image of the Neapolitan equivalent. 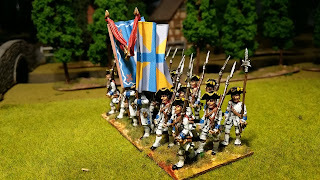 Of course it is highly likely that the regiments which were originally Spanish in the Neapolitan army just kept using their original flags too. List in Manley. 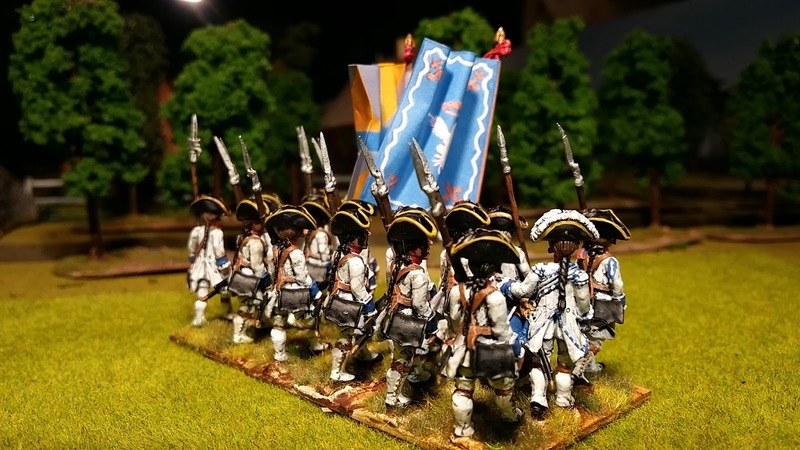 Another interesting article is by Boeri amnd Vela (also on the Net) called "The Army of the Most Serene Republic of Genoa in the Austrian Succession War". 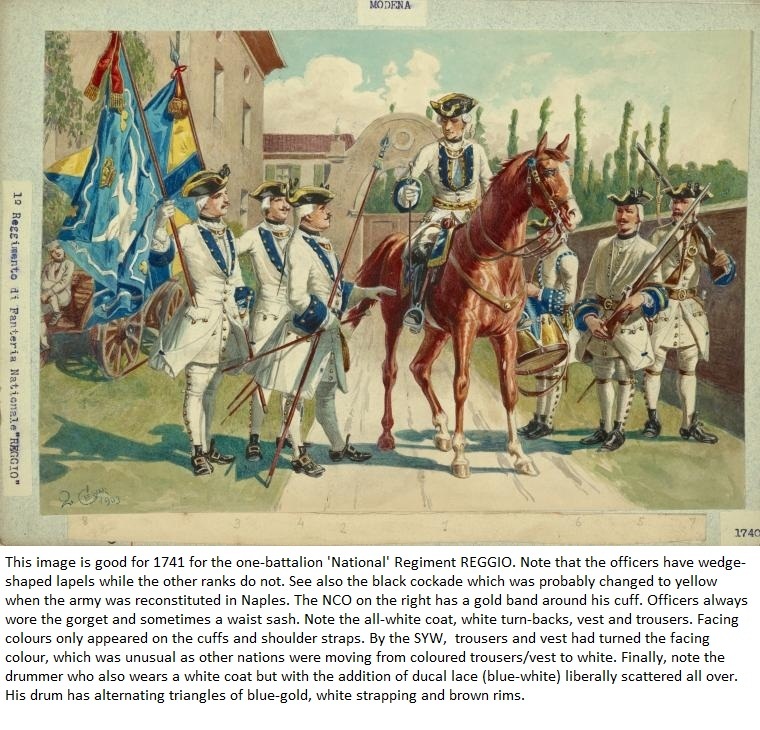 It lists Genoese regiments, gives details of their uniforms and shows what their flags looked like. 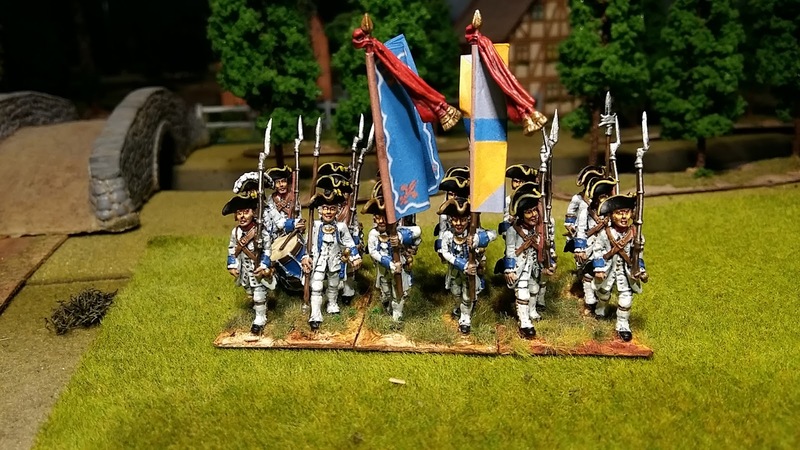 Maybe you could do a Genoese regiment or two? 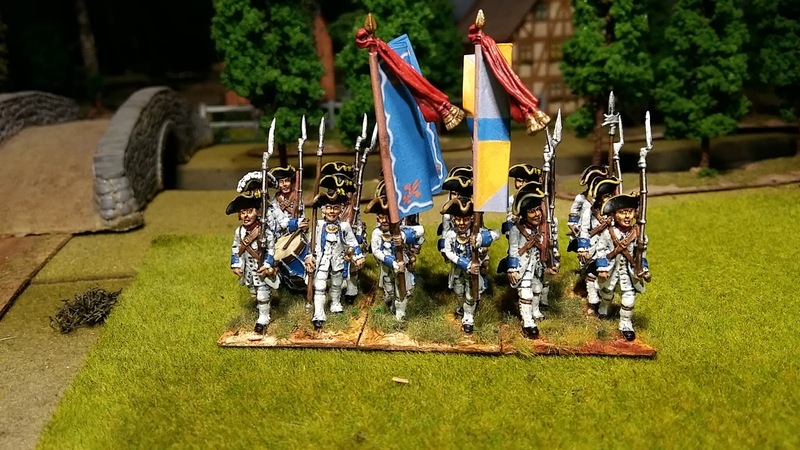 Looking at this lastest regiment you've done - is that Black Hussar figures? I've just dome Regt Vigier with them but the metal is appallingly brittle. I've had to replace two figures already which cracked under the gentlest of manipulation. I can see this regiment only coming out of the box when absolutely needed. We refought Camposanto last weekend at local show and I dread to think what state Vigier would have been in if it had participated. I was thinking about Genoa as I have seen some of their flags (I don't recall where)(a red cross on a white background) but they will have to wait until I do the western Italian theatre. As to the 3 rank 4 rank issue, whatever system (firing by rank or by platoon) I still don't think the forth rank will fire. It boils down to the issue of order mince and order profond. 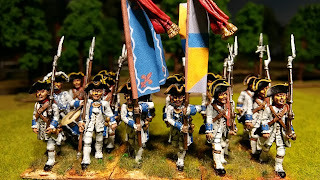 Yes Black Hussar figures. I have often had an issue with broken bayonets but they will replace breakages if you ask them.